Uzi Flash Drive Is Just A Terrible Idea These Days | OhGizmo! Well you know the drill by now. 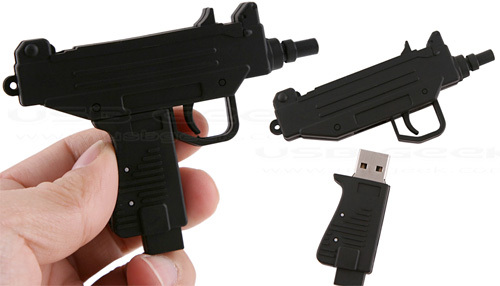 Even though it’s obviously not even close to being as big as the real thing, you throw one of these Uzi-shaped USB flash drives in your suitcase before hitting the airport and you can pretty much guarantee your vacation or business trip is over before it even begins. So I’ll let you decide if the $22 price tag for 4GB of novelty storage is worth getting your name thrown on every watch list around the world. The airport will take that away from you in a heart beat. Even if it's just suggesting weapons/violence, they take it away. My friend had a toy sword key chain from when he became a marine, his mom got it for him. They took it from him. Wouldn't even let him take/give it to someone.